You want to be the queen of social media. Millions of followers, getting paid to post. How do you get there? 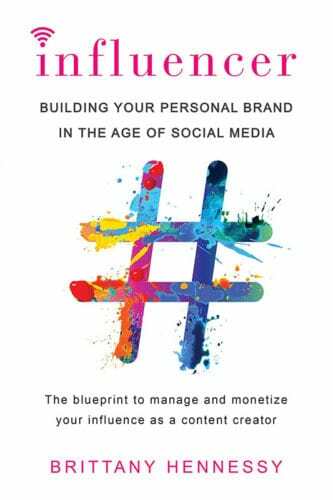 Influencer: Building Your Personal Brand in the Age of Social Media has the blueprint to building your empire. There are a lot of people who’d love the job of social media influencer. Adoring fans, free products, trips, and getting paid in return for posting. But what’s required to get to that point? Brittany Hennessy attempts to lay it out for you in Influencer: Building Your Personal Brand in the Age of Social Media. The book is broken down into four parts; Building Your Community, Packaging Your Brand, Monetizing Your Influence, and Planning Your Future. Chapters cover more specific areas; The Feed, The Audience, The Edge, The Press, The Money, The Contract, The Agent, and The Goal. It’s laid out in the same progression you’ll experience when becoming an influencer. Where you start, what steps you need to take, and what’s next from there. It’s a nice make-sense way of structuring things. At the end of each chapter there are answers to questions from popular influencers, providing insight from someone who’s experience in creating and growing their personal brand. While they’re interesting, they do seem a bit distracting from the focus of the chapter. A section devoted to Q & A from these folks may have worked a bit better. Though it’s written for females (and mainly those in the area of fashion, lifestyle, and travel), most of it would also be applicable to men looking to become social influencers. While the information provided in Influencer is great, it seems a bit thin. Topics are covered in a fairly high-level view and it seems the steps are taken too quickly. It’d be great to see more in-depth examination of each of the areas covered. A big focus on creating content people want to see is needed. Though that need may be met with other books, it’d still be great to share insight within a single guide to making it big in the age of social media. As someone who has run influencer programs for Fortune 500 brands and is an influencer himself (millions of followers across multiple social networks), it’s not as simple as portrayed. This book gives a bit of a false sense of the ease with which one will progress. Not everyone can be an influencer and becoming one won’t happen overnight (or even within a year in most cases). Though I suppose it’s no different than business books leading people to believe anyone can build a million dollar business. While it would benefit from a more thorough look at each of the topics covered, Influencer does a great job of giving the reader a basic understanding of the key pieces they’ll need to know in order to become successful social media influencers. It covers areas from getting started to super success, providing insight for those building their own brand. If you want to get started on the way to social media superstardom, grab a copy of Influencer: Building Your Personal Brand in the Age of Social Media from Amazon now.